I MAY BE ABLE TO START TO OFFER SOME P2P TRANSACTIONS IN THE STATES NOW, DEPENDING ON THE AMOUNTS & LOCATION, CALIFORNIA BEST ATM. Apart from the coins that I am holding on behalf of the Hannah fund, (three) edit, now five friends have asked me to buy & hold coins on their behalf, recently (Oct 2013) there has been a lot of interest from first time buyers on http://www.reddit.com/r/litecoin wishing to purchase Litecoins, so I have offered to sell some for cash deposited in to either a UK bank, a Spanish bank or Wells Fargo in the US. I am also happy to buy any BTC or LTC that you may wish to sell for the current spot price, this just for UK bank deposits atm, US probably later this year, EU maybe next year. 2013 10 31 First sale for £300 ($482) UK: 218 ltc @ $2.21 - DeliveryNinja - Completed - Feedback - Note all sales not marked in red have been completed & coins sent, most were nearly instant, UK especially. 2013 11 18 Forty-third sale $2,000 US: 280 ltc @ $7.22 - Anon 7, FC - repeat customer - cancelled & changed to a $490 for 67.86 ltc order, that now also cancelled due to circumstances beyond the buyers control. 2013 11 19 btw, whoever sent me €50 Mr MDPE, please email me as I can't find any record of our having set up a deal. Recommenced sales, but no longer listing & posting them publicly. Note: I will never use your real name here, or reveal it, just a forum ID if you contacted me that way & don't mind. I usually only update this list every few days, so it may lag a little in showing the sales that have already been completed & the new ones. 2013 10 31 to 2013 11 08. All customers delighted, so far, green candles ftw. In one week we've seen a 60% plus rise, from $2 to > $3.20 O_O <--- this now old news, I haven't even had a chance to work out how much we're up now to date at over $4.45, but much better than the Twitter shares IPO 73% pop this week I'd expect. 2013 11 07 Litecoin has doubled in value within a week - Remember at some point there will be a correction, the higher we go the bigger it's likely to be. Selling at the Last Price (top left of page) from LTC/USD on BTC-E. I expect that later this year (2013), or early next, we will see LTC on some more exchanges & one of these will quote a realistic USD/LTC price, but for the moment that's the way that I buy them myself & I would be selling at the current spot price so it should be the best possible that's available anywhere I imagine. 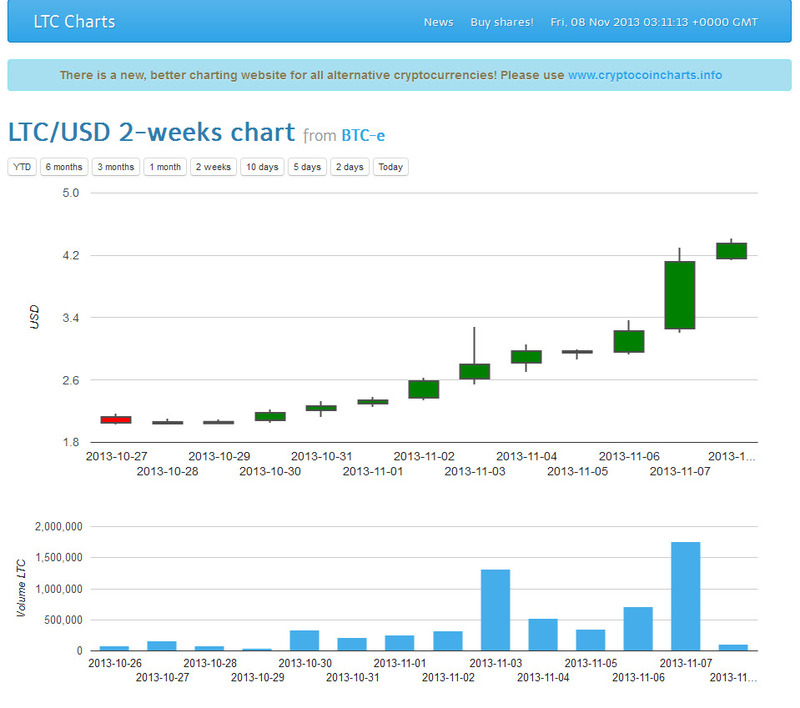 I'm also happy to take Bitcoins in exchange for Litecoins at the current Btc-e BTC/LTC price. If you accept my quote & we agree on the amount of coins that you wish to buy, then the price is locked in at that rate, I will give you further details re payment, please don't send any funds without checking first with me that it's OK, once I have your cleared funds then I will quickly send the coins to your Litecoin address, please make sure that your wallet is encrypted & secure, I'll send a small token test transaction first for you to confirm. My reputation <--- basically I've given away & donated many more coins than any of these transactions made so far. I am also offering for sale 50 Casascius 1 BTC & 50 Half BTC physical coins, they are located in Spain & can be picked up in person in Gerona, or by arrangement in Barcelona or on the Costa Brava (if we can coordinate with my visiting), otherwise to be posted by registered, to be signed for, mail at your own risk for any loss or damage once sent, though if they are proved to have not been delivered I will put a claim in for whatever value that service covers, if you require insurance &/or courier shipping then please to let me know & I will look in to it & the costs. Registered shipping is included in the price & they will be dispatched within 24 hrs. If I'm going to a Bitcoin conference I will also be selling them there, I was at the 2012 London & Madrid Bitcoin conferences, though I shall not be at San Jose 2012. 0.5 BTC coins are 0.88 btc each & only 7,000 were made. They have been only been handled briefly once since they arrived, this with new white cotton gloves in order to place them in high quality AirTights which are included in the sale, they come from a smoke & animal free home (my animals all live & smoke outdoors). It's next to impossible to pick a starting place where the price just goes on up, in fact falls of up to 50% should be expected from time to time, when this happens it may be a good opportunity to lower you average buy-in price by getting some more, if you plan to hold for the medium to long term - then I expect that you may do very well, while crypto-currencies are high risk, they are also potentially very high reward & I personally believe that they could be the opportunity of a life time right now. These were the first that I bought, from August to November 2011, falling in price from over $10 to under $2 during that time. Pro-tip hang on to your coins & don't lend them out to what look like get rich quick schemes, especially if the borrower is named pirate or similar & appears to be running a Ponzie scheme or mining operations, with projected exceptional returns. Just as the Internet freed up the world of communication & information, I expect crypto-currencies to free up the world of commerce & investment, along with money transmission, remittances, smart contracts & property among many other uses, they are going to be very disruptive & shake up a whole bunch of stuff.